If NATO Cares About International Crimes of Aggression, Why Have Only 14 Member States Ratified the New ICC Statute? From the 17 July 2018, the International Criminal Court (ICC) will be able to prosecute leaders responsible for waging aggressive war – with conditions. This is the fourth ‘core’ crime that the ICC has jurisdiction over and is the first time since the post-WWII trials in Nuremburg and Tokyo, that an international court will be able to hold leaders individually criminally responsible for waging aggressive war. The crime was included in the ICC jurisdiction back in 1998 (when the court was established), but was suspended until its elements could be decided (in 2010) then ratified by at least 30 states (in 2016). To date, 35 states parties have ratified the new statute, including 14 NATO member states: Belgium, Croatia, Czech Republic, Estonia, Germany, Latvia, Lithuania, Luxembourg, Netherlands, Poland, Portugal, Slovakia, Slovenia and Spain. This means that over half of the NATO member states have not done so, including three states – France, the UK and USA – that also hold permanent seats at the UN Security Council. The UK and France, rather shockingly, appear to have done all they can to block the process on the grounds of seeking ‘greater clarity’. The United States has been a longstanding opponent of the court. Acts of aggression are defined under the statute as: invading another state; bombing another state; blockading the ports or coastlines of another state; attacking the land, sea, or air forces, or marine or sea fleets of another state; violating a status of forces agreement; using armed bands, groups, irregulars or mercenaries against another state; allowing territory to be used by another state to perpetrate an act of aggression against a third state. 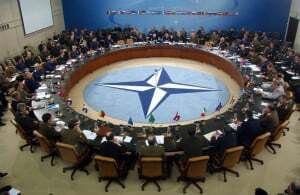 In light of the amount of space given to allegations of Russian acts of aggression in the recently concluded Brussels NATO Summit Declaration, the reticence among key alliance member states is all the more surprising and hypocritical. And NATO as an institution, through the Secretary General Jens Stoltenberg, could have spoken in favour of the court but has failed to do so, no doubt a reflection of the divisions within the alliance on this issue. “the superpower veto means that it will not be allowed to finger the collar of any politician or military leader who has acted in alliance with one of the security council’s ‘big five’”. Nonetheless, this is a potentially powerful addition to the ICC’s jurisdiction. The need to hold to account those responsible for illegal acts of aggression remains one of the biggest challenges of our time. Consider Russia in Crimea, the US and UK in Iraq, Saudi Arabia in Yemen, etc. The capability to scrutinise illegal military interventions and, in some cases, prosecute those responsible for them, should help to move our system of international relations towards a stronger rules-based approach, rather than one based on military power. And even with the right of veto, the new statute may act as a deterrent on coalition-type military interventions – as argued by Tom Dannenbaum. If, for example, a possible, proposed, or ongoing use of force by the United States would meet (even potentially) the criteria for a criminal aggression, this might deter foreign cooperation with the action, including among longstanding US NATO allies that have signed the statute. These include Germany (with its US military bases), Poland (a significant contributor to the 2003 invasion of Iraq) and Belgium (the home of NATO decision-making). The key question, from the US and these allies’ perspective, is: under what conditions would such leaders be criminally liable for cooperating in a US act of aggression? In conclusion, while prosecution by the ICC for illegal war-mongering remains unlikely as of today, the addition of the crime of aggression to the court’s legal toolbox should be cause for optimism. Public pressure is now required to increase the number of signatory states to the statute, especially in those 15 NATO member states that shamefully remain outside of its jurisdiction.